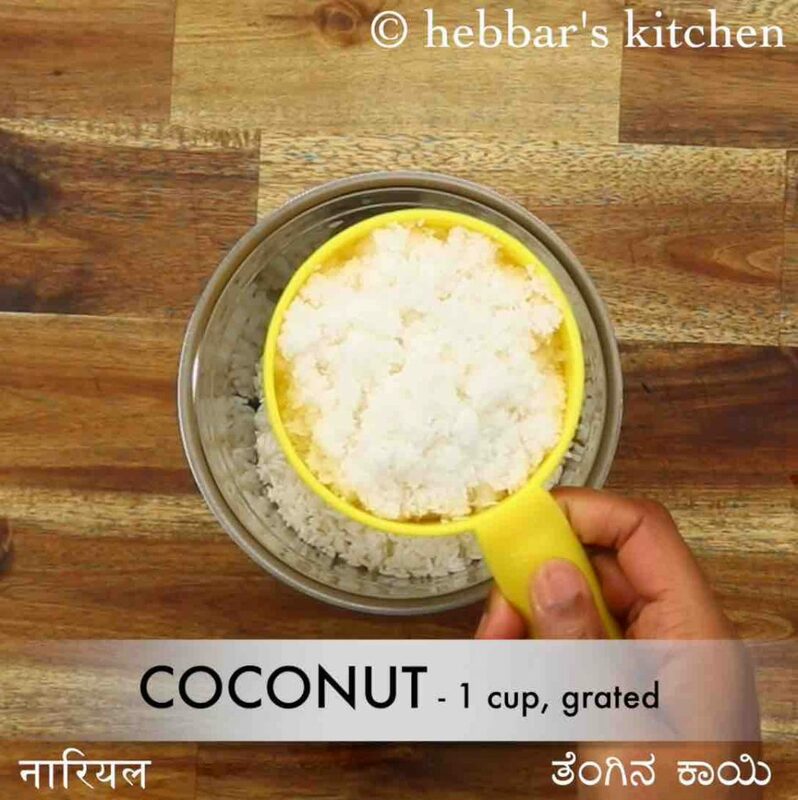 halbai recipe | halbai sweet recipe | how to make rice halbai with detailed photo and video recipe. an authentic and traditional dessert recipe made with rice and jaggery. basically, it is one of the popular delicacies from the udupi and mangalore cuisine and is generally made for occasions and celebration feast. it is very simple and easy to make as it contains very basic ingredients like rice, jaggery and coconut. 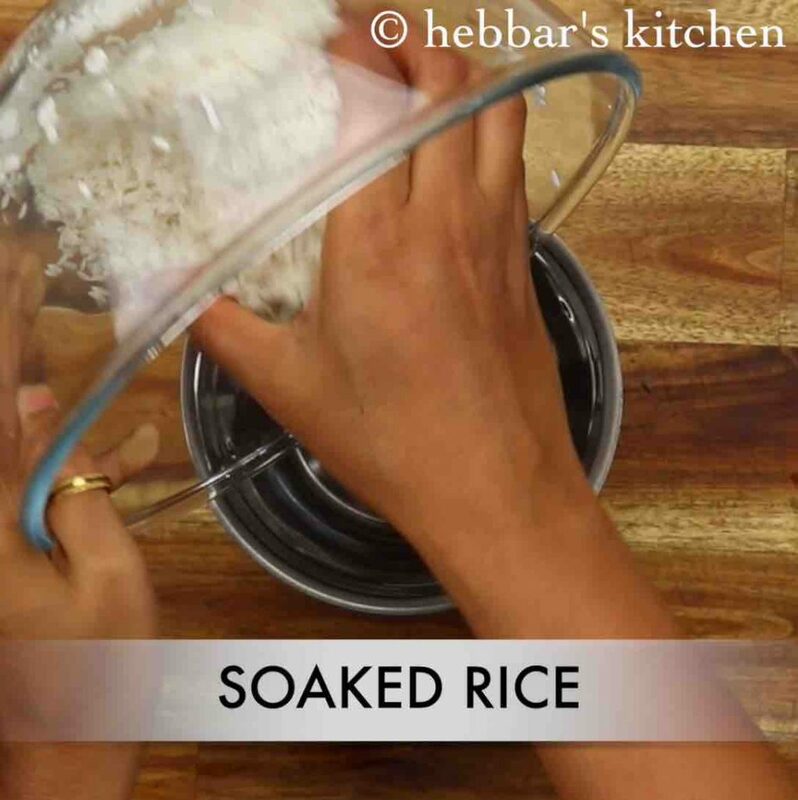 halbai recipe | halbai sweet recipe | how to make rice halbai with step by step photo and video recipe. udupi and mangalore region is known for its healthy and tasty delicacy it holds in its cuisine. most of the recipe belongs to the breakfast and snacks but it does have lot of traditional recipes too. 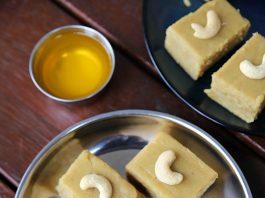 one such unique and traditional sweet recipe is halbai recipe or rice halbai halwa made for occasions and festival. 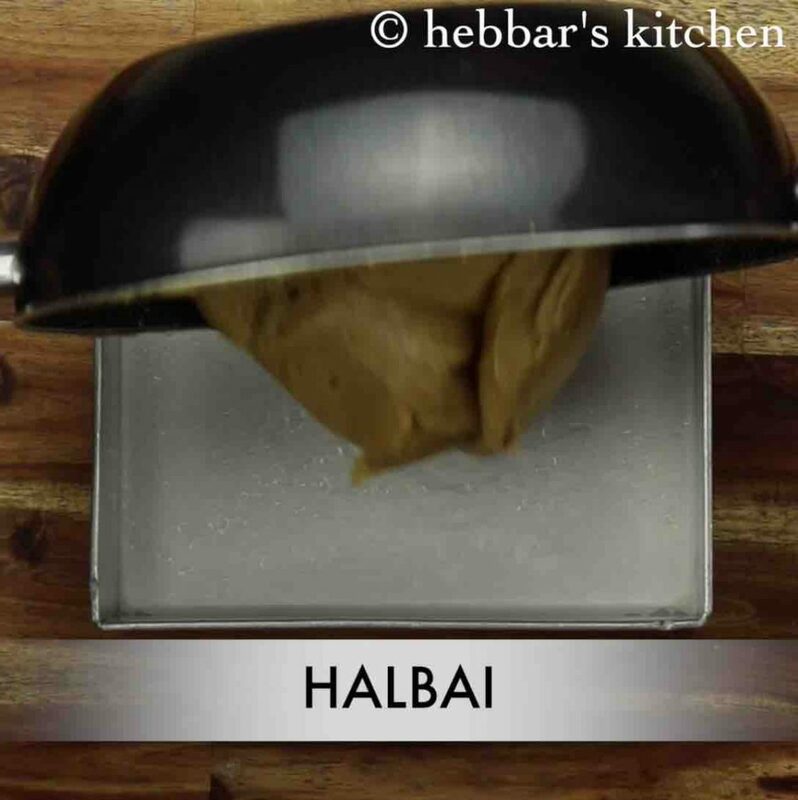 as i mentioned previously, halbai sweet hails from the world famous udupi or south canara cuisine. and it is very popular dessert recipe across the coastal belt. having said that, it would be unfair to call it as a karnataka cuisine recipe. as many non coastal kannadiga’s may not be aware of this recipe. as matter of fact, you may have to develop a taste for this sweet. if you are totally new to this recipe, you may find it bizarre and tasteless. moreover the texture can be skeptical for most of them. 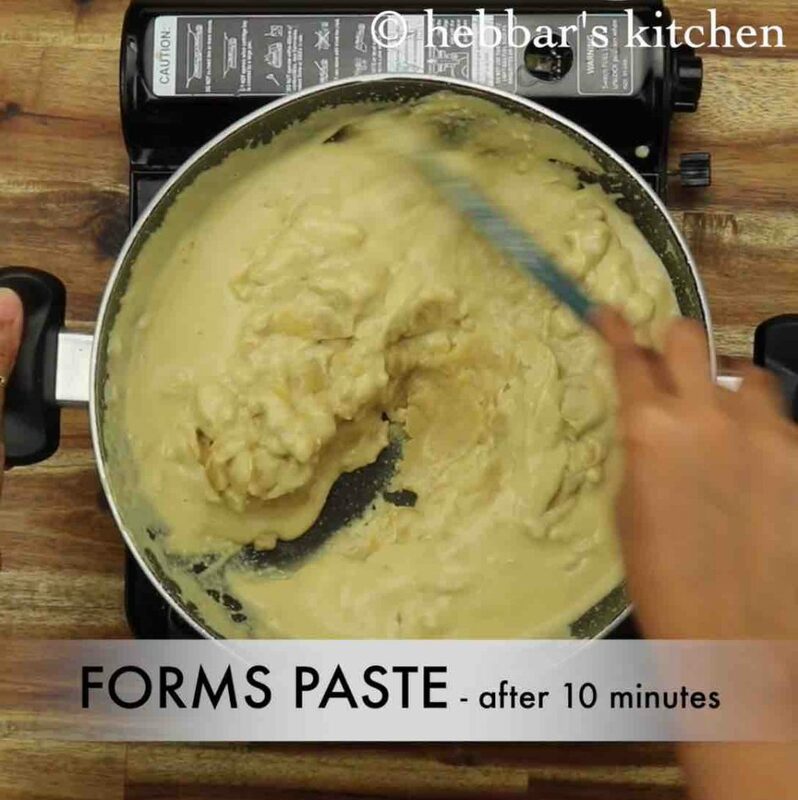 even for me, i was not a great fan for this recipe during my childhood. but gradually i have developed a great taste for it and i crave for this recipe whenever i visit my native place. anyway, some tips, suggestions and variations to this classic rice based halbai recipe. firstly, i have used normal day to day use sona masuri rice to make the rice batter. and i would heavily recommend to use the same and avoid especially basmati rice as it does not yield smooth rice batter. 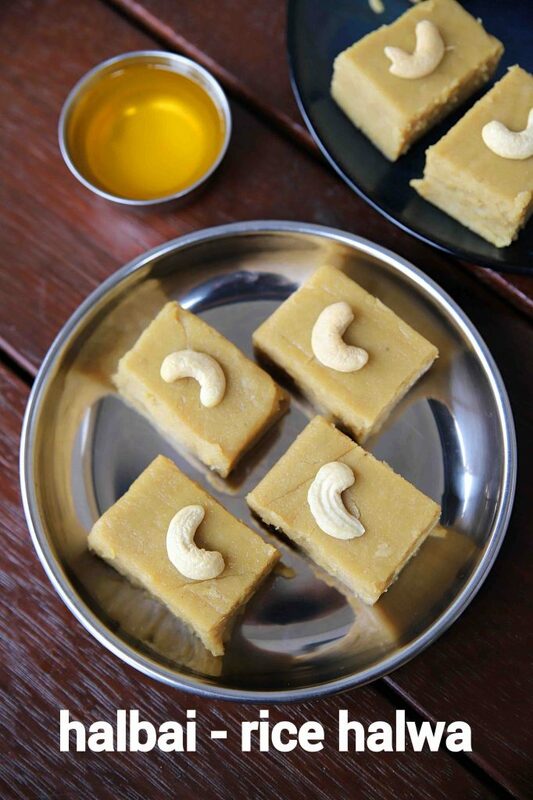 secondly, the recipe uses jaggery for sweetness and using jaggery gives a nice texture and colour to the sweet. 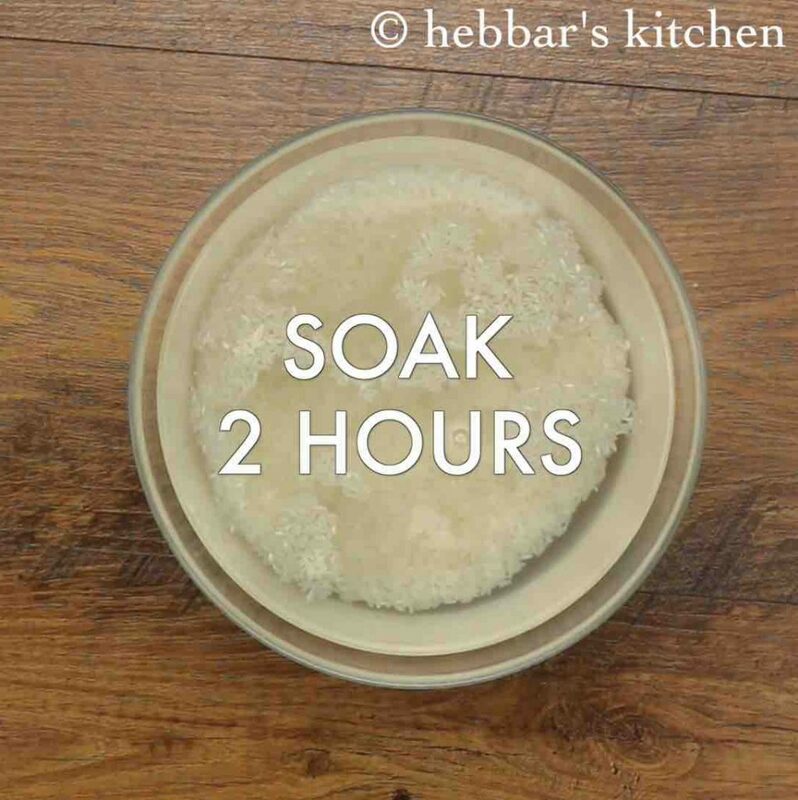 however, if you do not have access to it, you can use brown sugar as alternative. 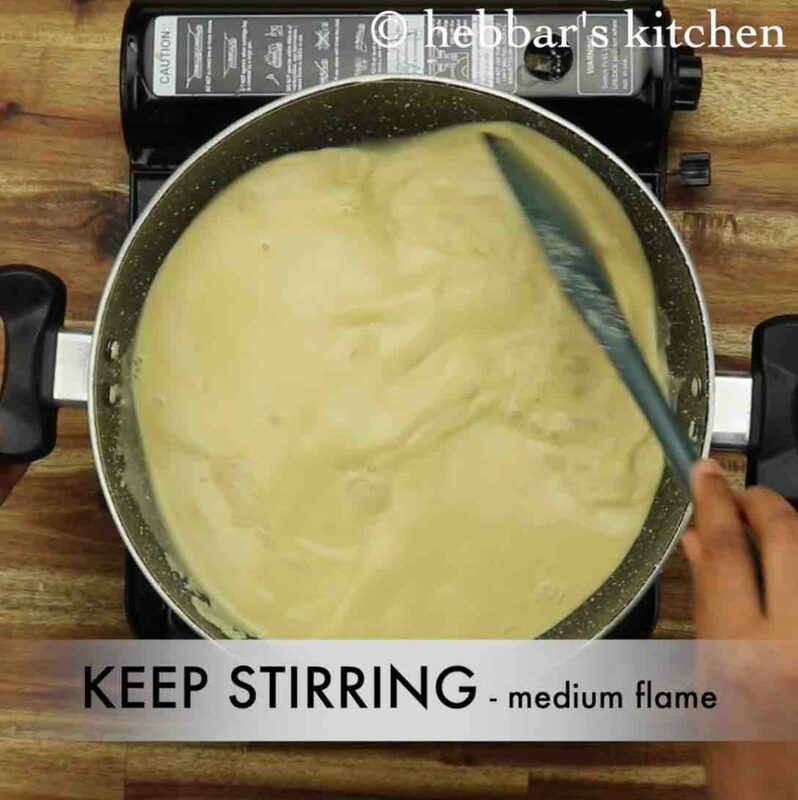 lastly, you have to continuously stir and mix the batter and jaggery mixture on a low flame. you may find it tiring, but unfortunately there isn’t any shortcut for this step. firstly, in a large bowl soak 1 cup rice for 2 hours. drain off the water and transfer to the blender. add 1 cup coconut and ¼ cup water. 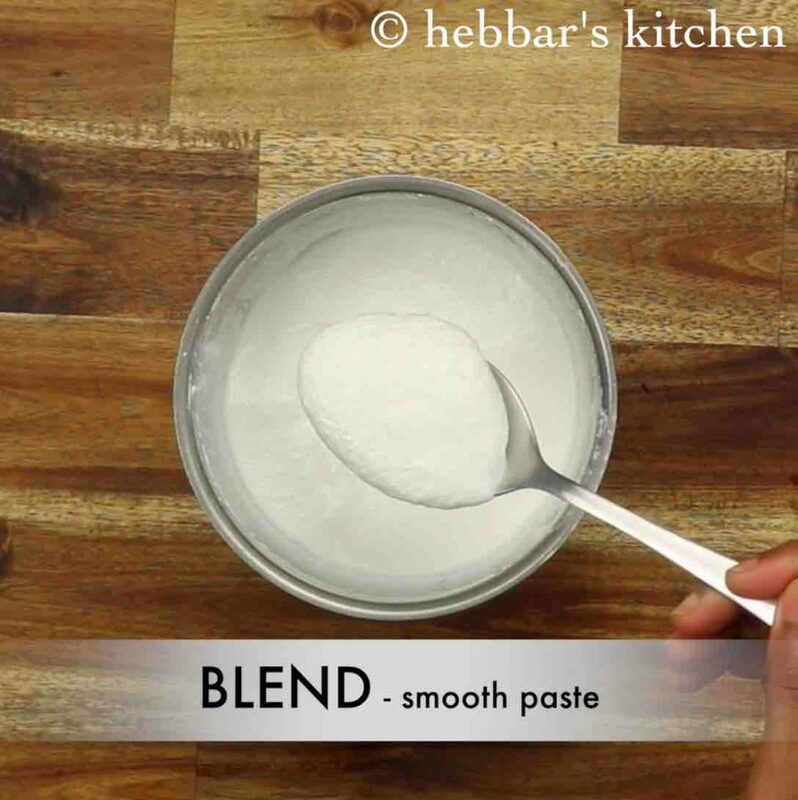 blend to smooth paste, keep aside. 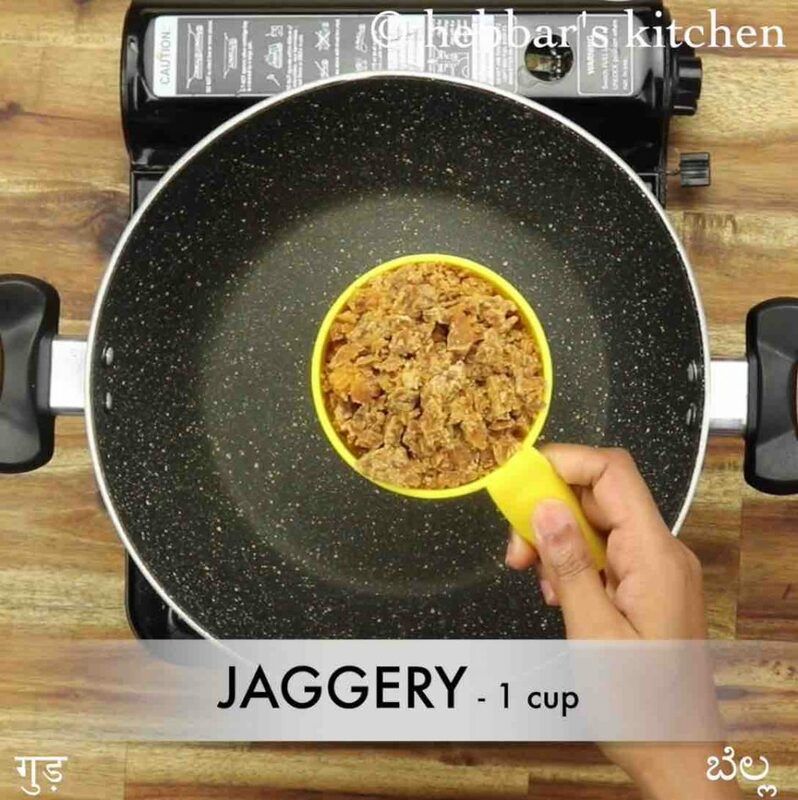 in a large kadai take 1 cup jaggery and add 2¾ cup water. 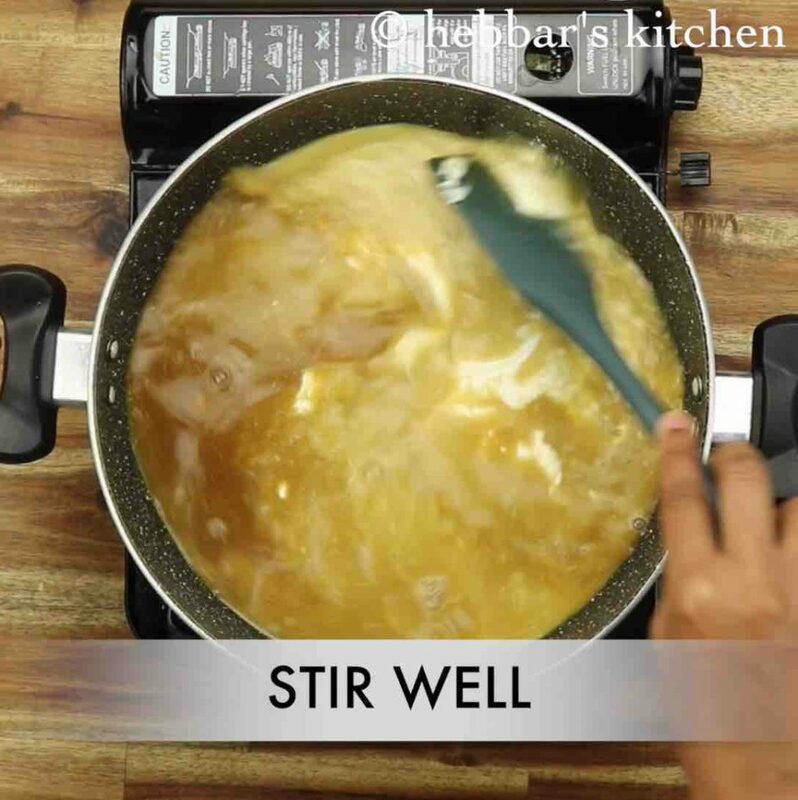 stir well until the jaggery dissolves completely. 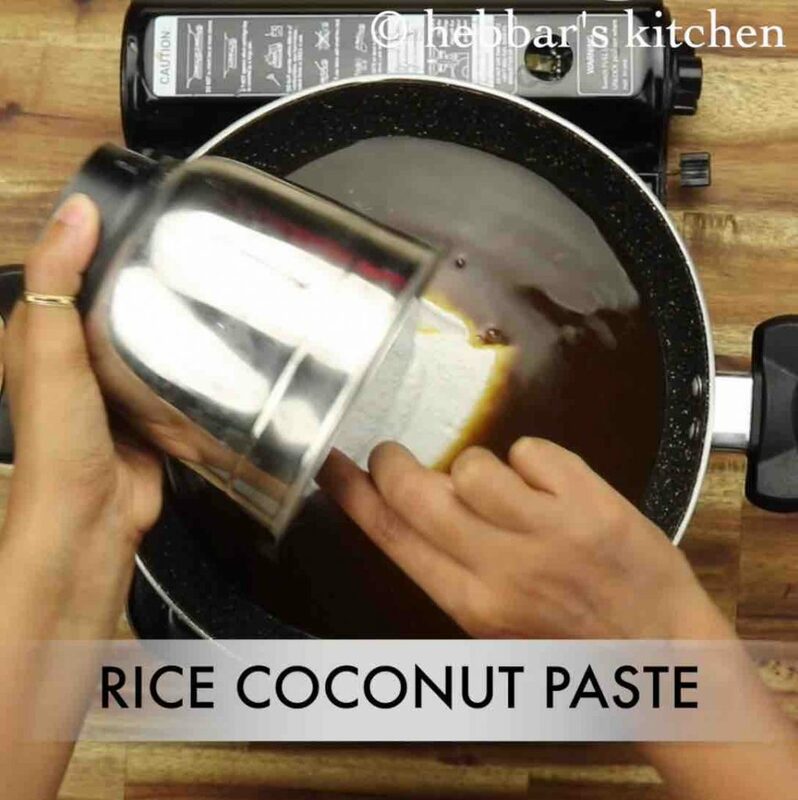 add in prepared rice coconut paste, ¼ tsp salt and stir well. 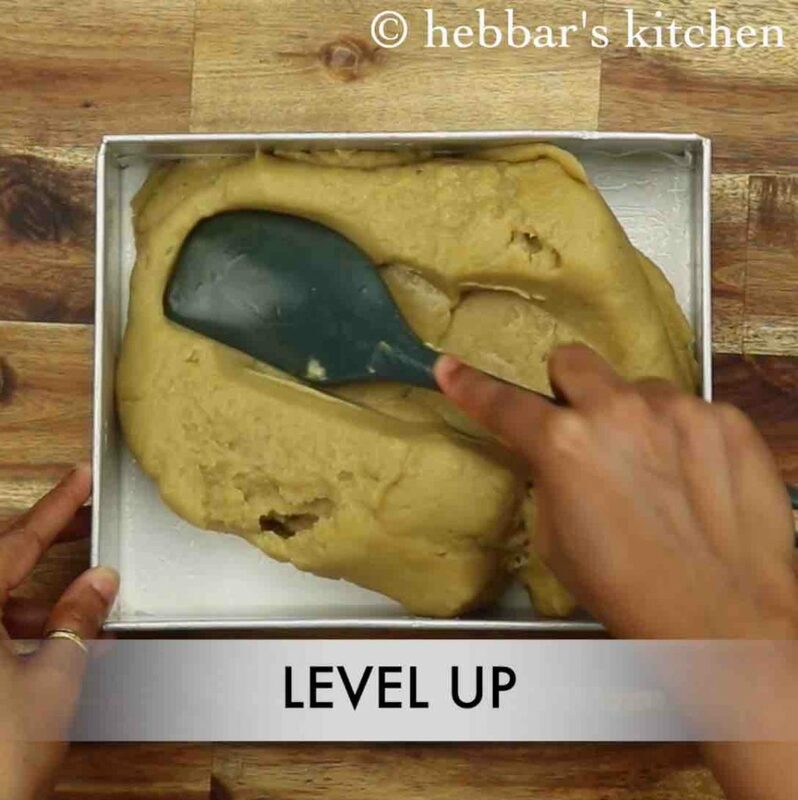 stir until the mixture is well combined without forming lumps. further, add 2 tbsp ghee and mix well. 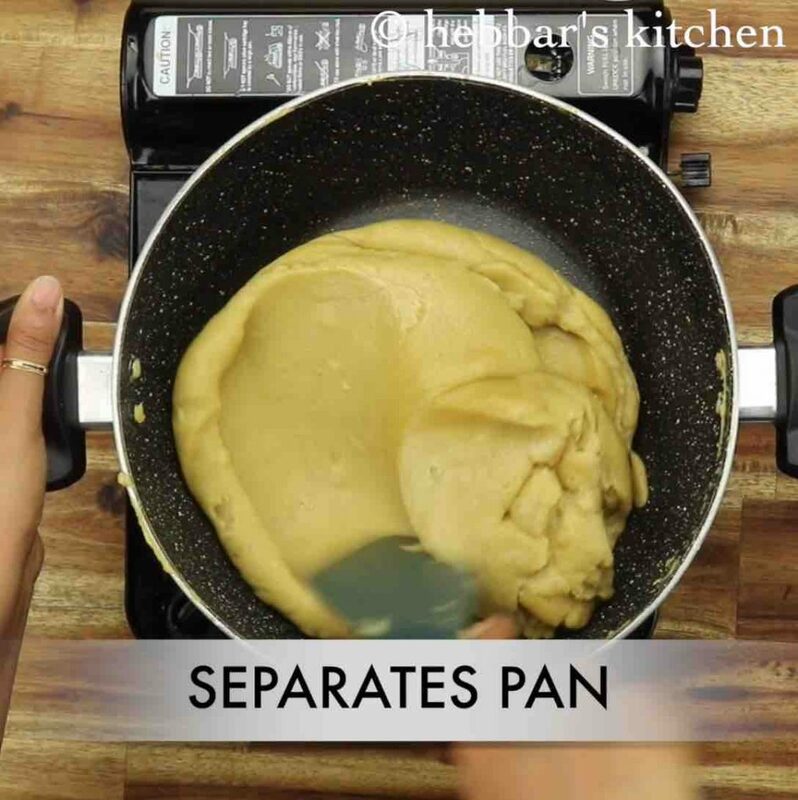 the mixture will start to turn glossy and separates the pan after 15 minutes. level up spreading uniformly. rest for 30 minutes or until it sets completely. after 30 minutes, slowly unmould the halbai. 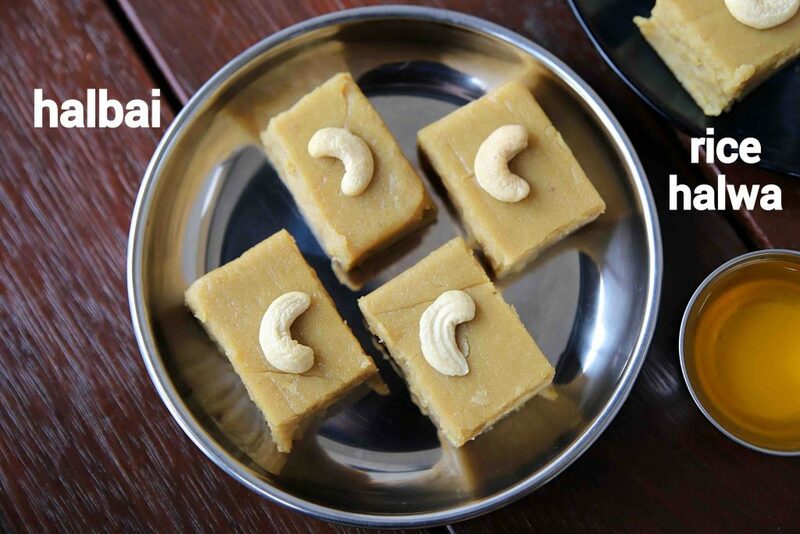 finally, garnish with cashew and enjoy halbai or rice halwa with ghee during nagarpanchami festival. 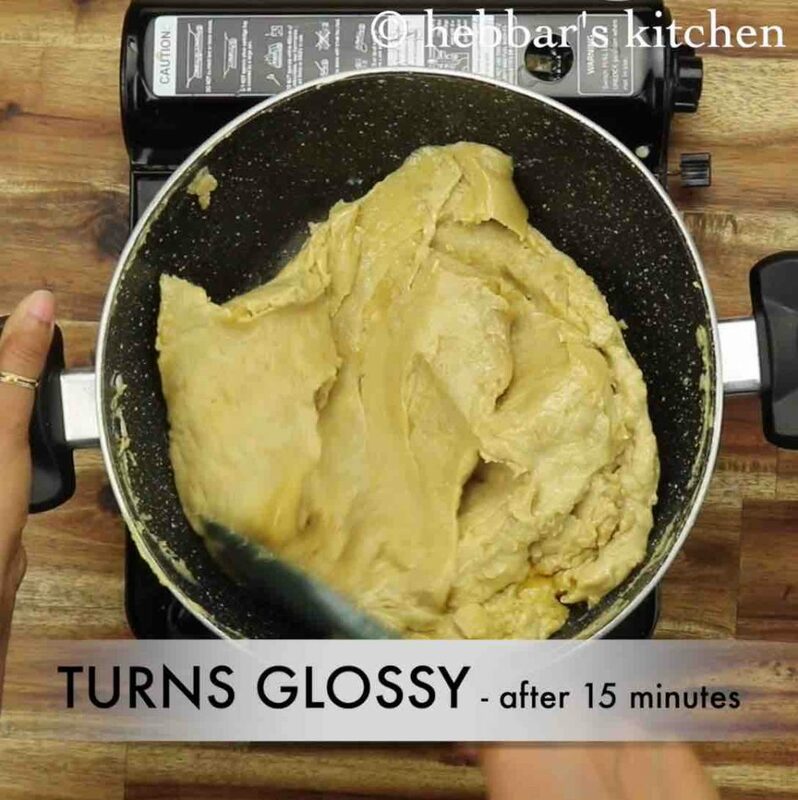 stir well until the jaggery dissolves completely. 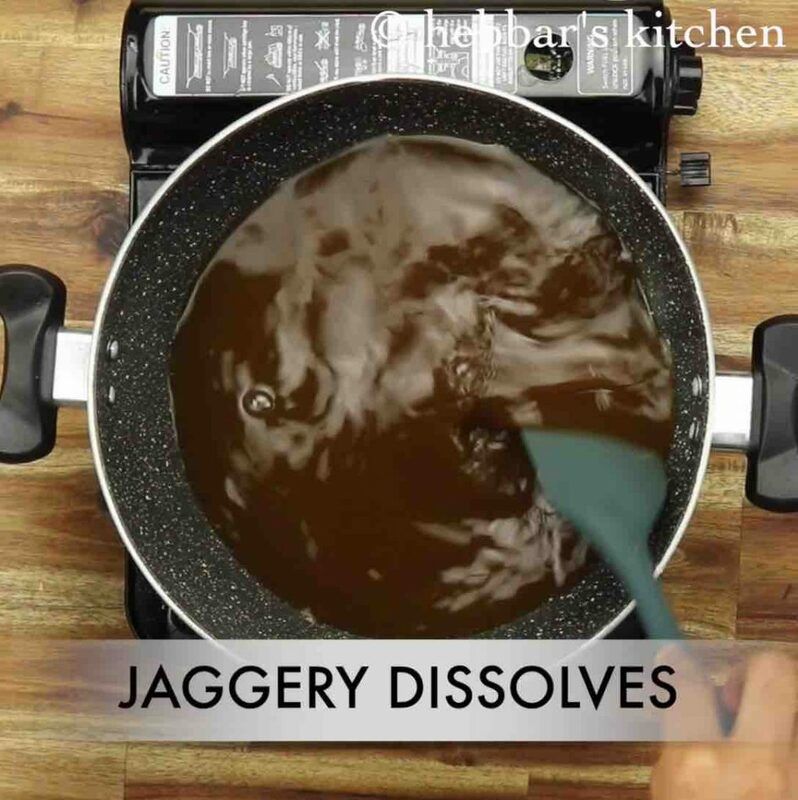 strain off the jaggery water if there is any impurities. continue to stir keeping the flame on medium. the mixture starts to thicken after 10 minutes. once it starts to hold the shape, turn off the flame. 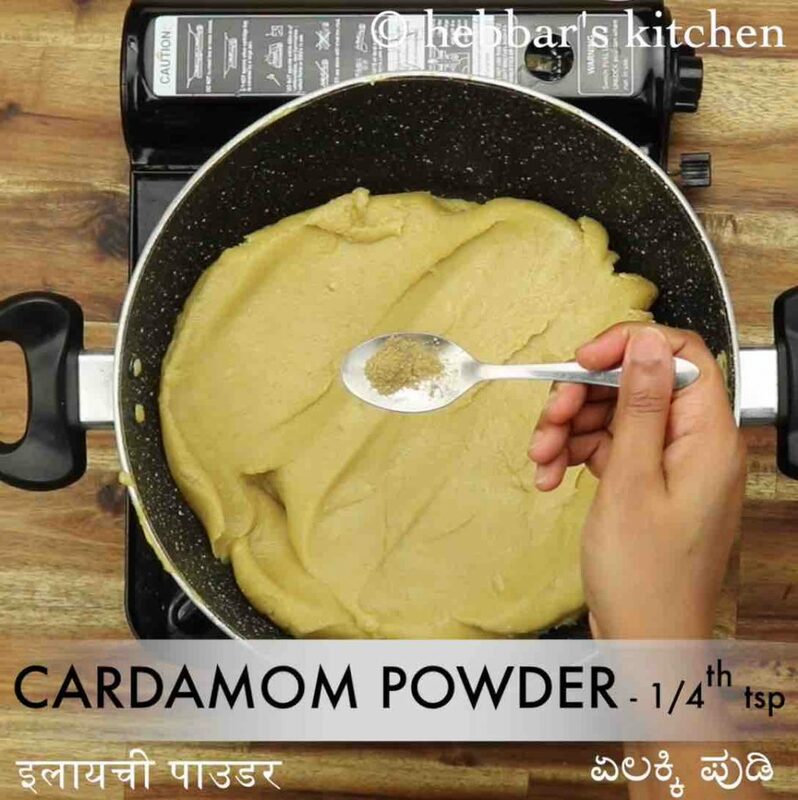 add ¼ tsp cardamom powder and mix well. transfer to a tray (width: 15 cm, height: 6 cm, length: 17 cm). make sure to grease the tray with ghee to avoid sticking and line butter paper at the bottom of the tray. 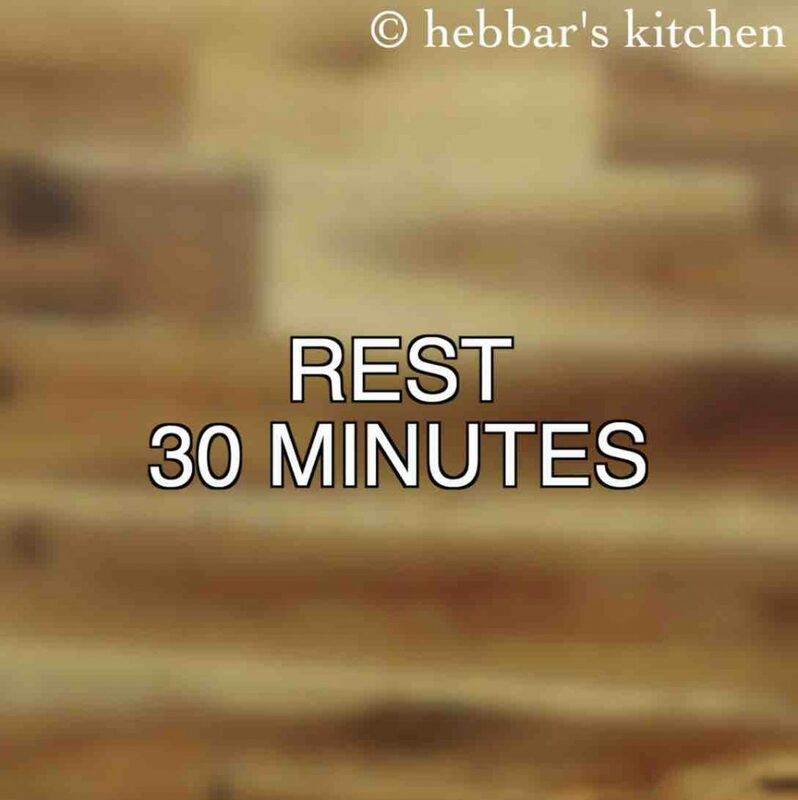 rest for 30 minutes or until it sets completely. after 30 minutes, slowly unmould the halbai. 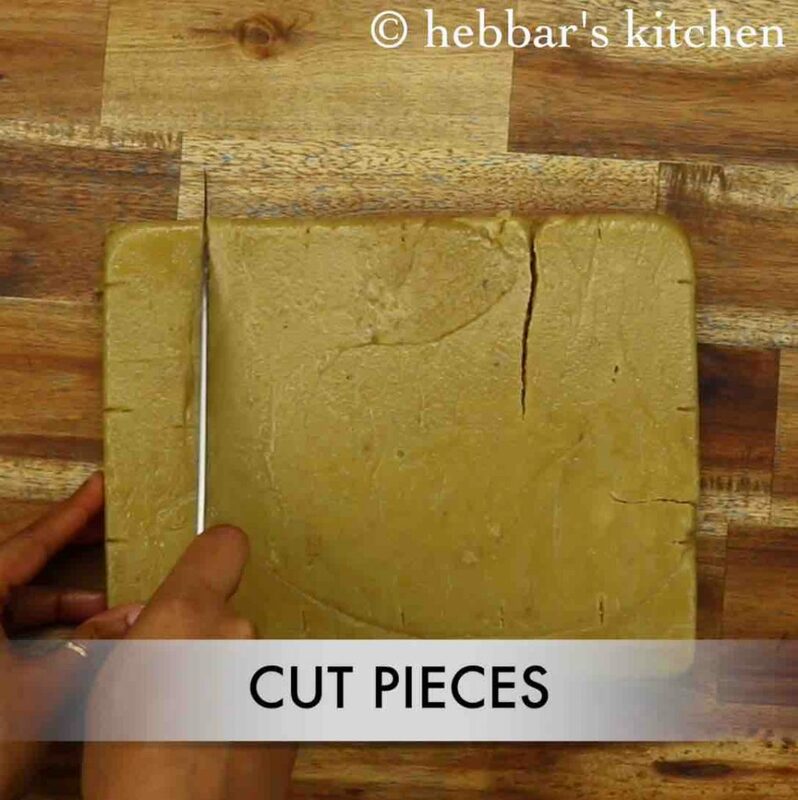 cut to the desired shape. 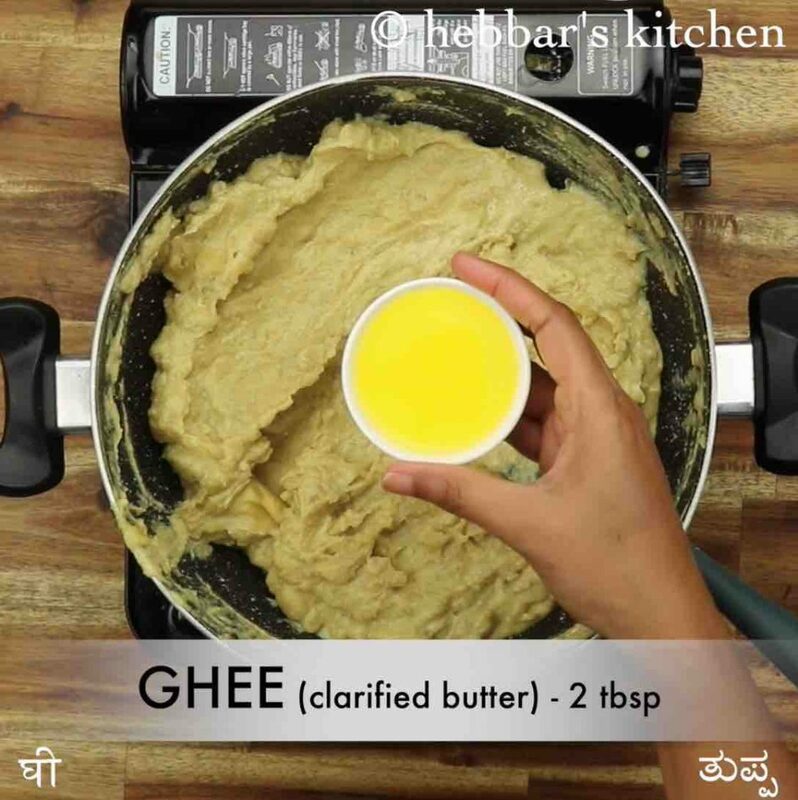 make sure to grease the knife with ghee to prevent from sticking. firstly, use 1:3 proportion of rice and water ratio to get a perfect consistency. also, traditionally, the akki halbai recipe is set over banana leaf instead of a tray. additionally, if you are looking to prepare raagi halbai to replace rice with raagi. finally, halbai recipe stays good for 2 days when refrigerated.